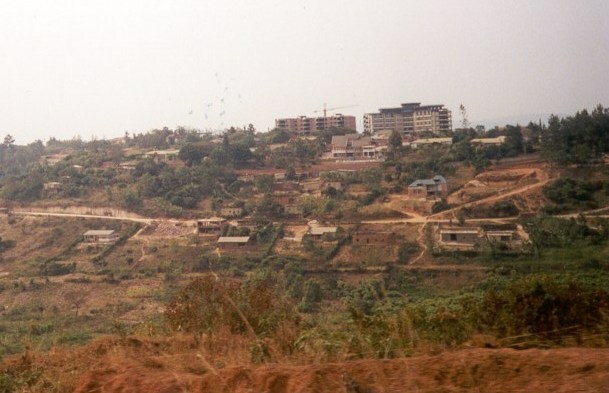 I arrived in the Rwandan capital city, Kigali, and then traveled to Cyangugu. 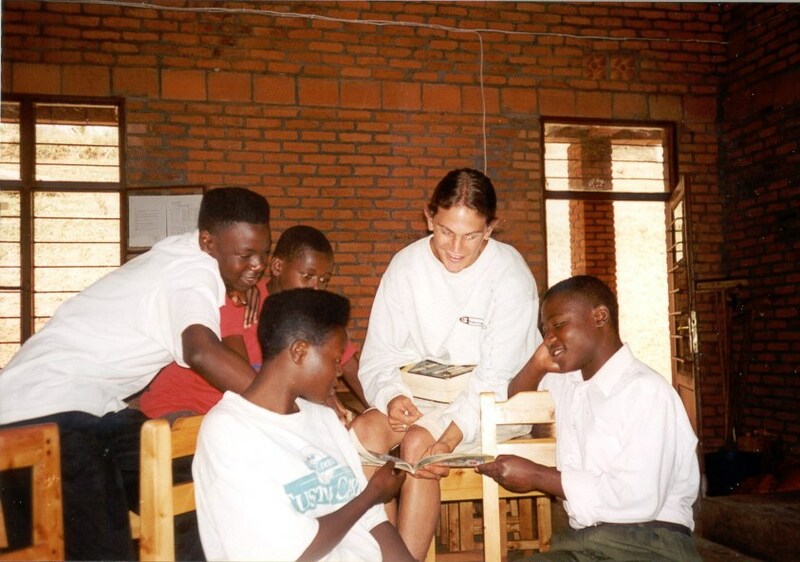 Before leaving, I stopped briefly in Butare. Click on each photo to see a larger, more detailed version. 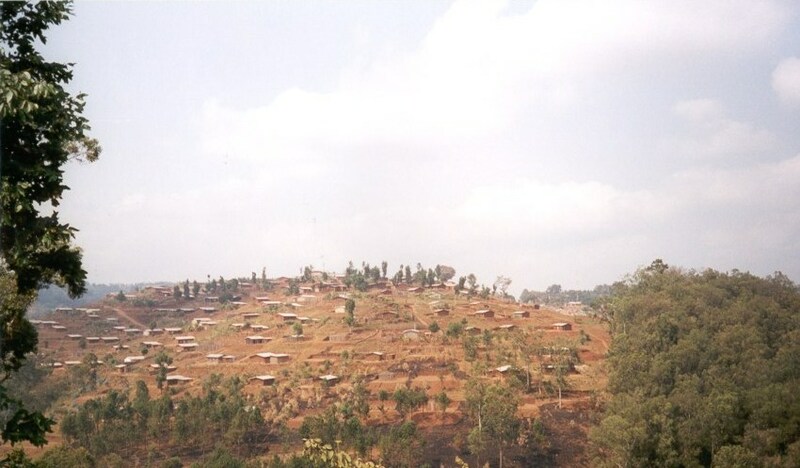 You could see construction projects on many of the hills, and a Nongovernmental Organization (NGO) could be found on almost every corner. 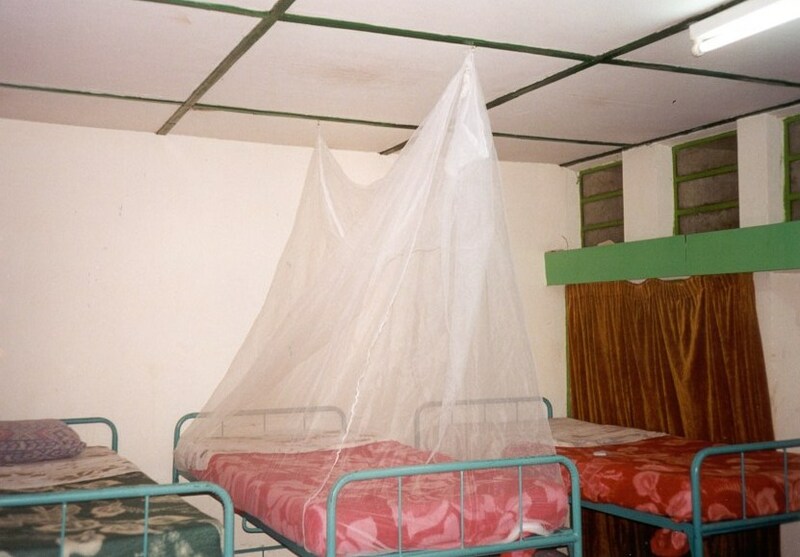 At the dorm room at L'Eglise Episcopal Au Rwanda in Kigali, I had to set up my own mosquito net from scratch for the first time. 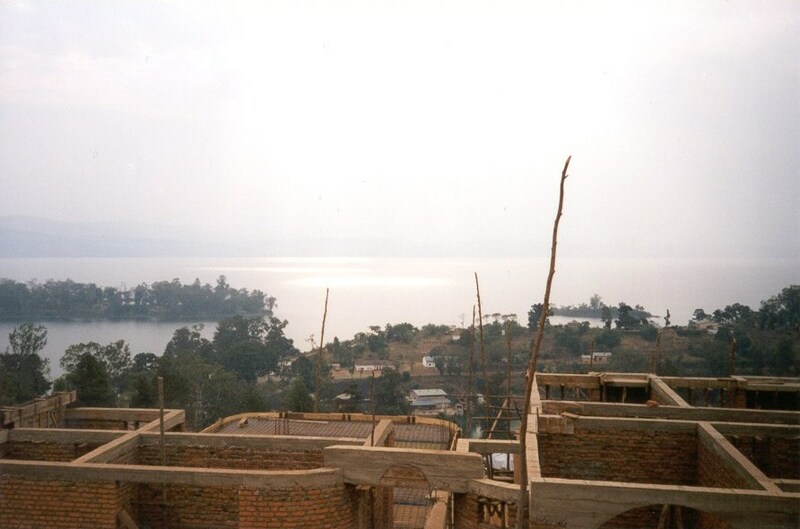 On my second visit in Kigali, after visiting Cyangugu, I climbed a building being constructed. 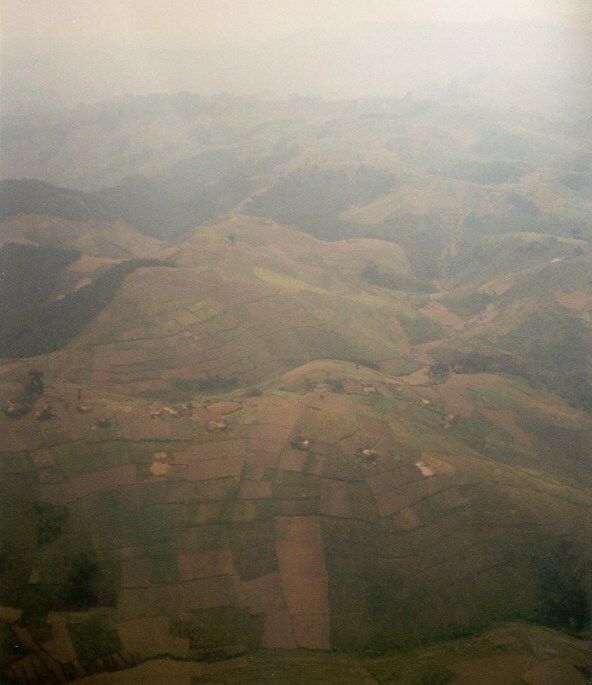 On the airplane ride to Cyangugu, it was easy to understand why Rwanda is called Pay Des Milles Collines, the country of a thousand hills. 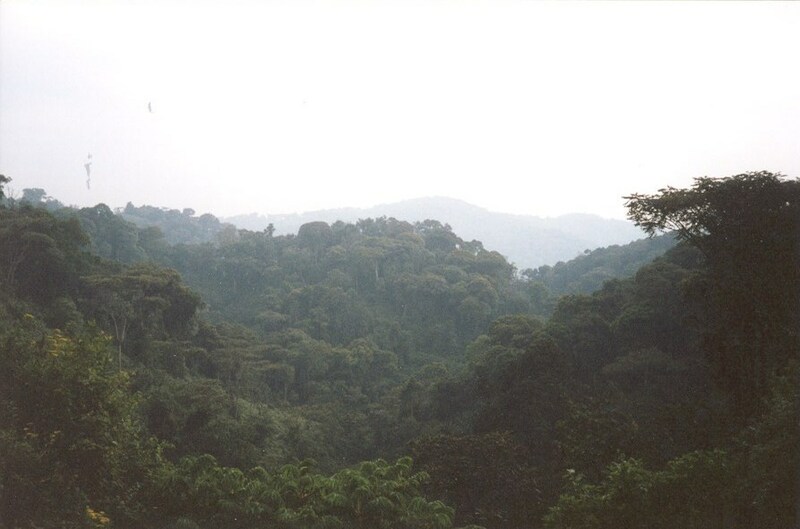 It was also evident why a book about the Rwandan gorillas was named, Gorillas in the Mist. 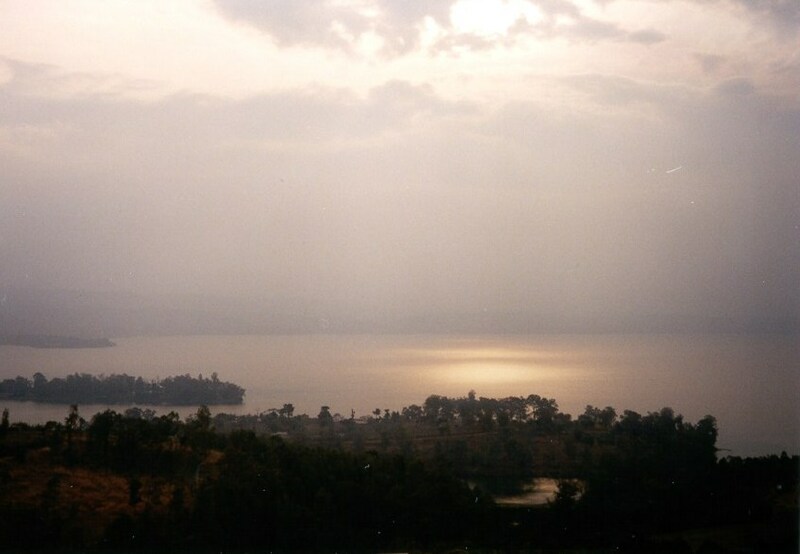 After flying for a brief time, we flew over Lake Kivu to land in the city of Cyangugu, near the border of the Democratic Republic of the Congo. 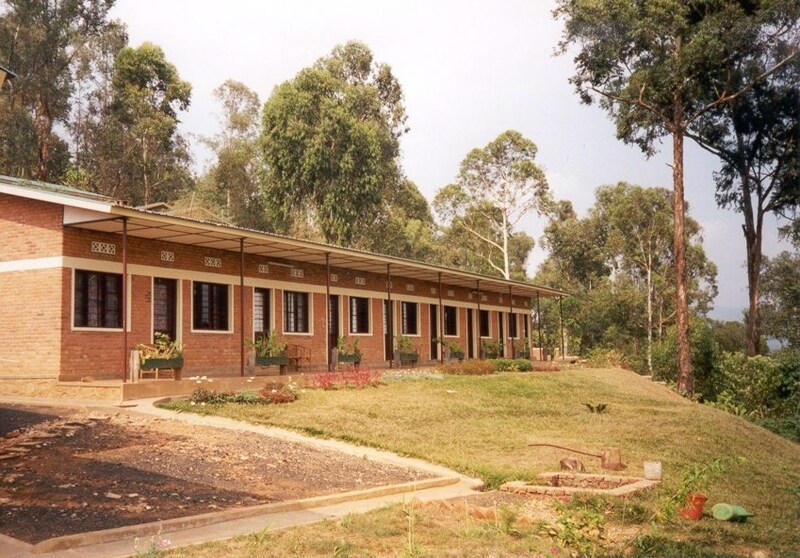 The guest house of L'Eglise Episcopal au Rwanda in Cyangugu was perfect for travellers. 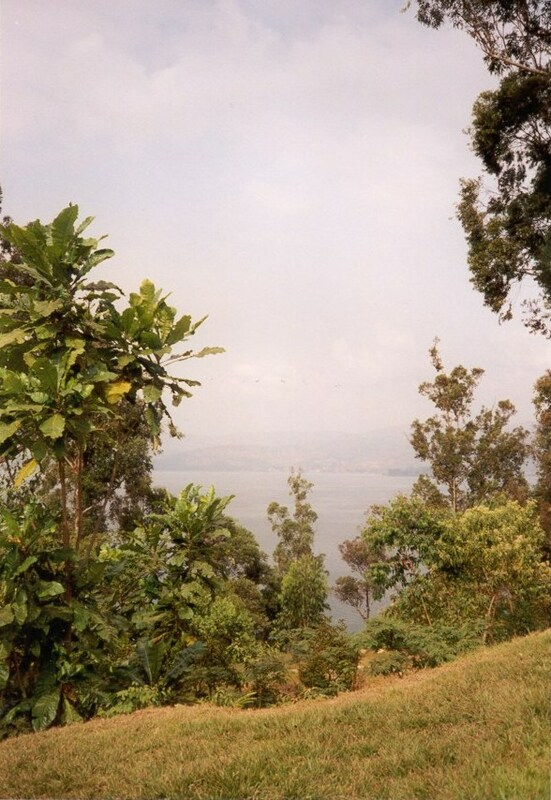 The guest house was located on a hill right on the edge of Lake Kivu, which made for a stunning view of the lake. 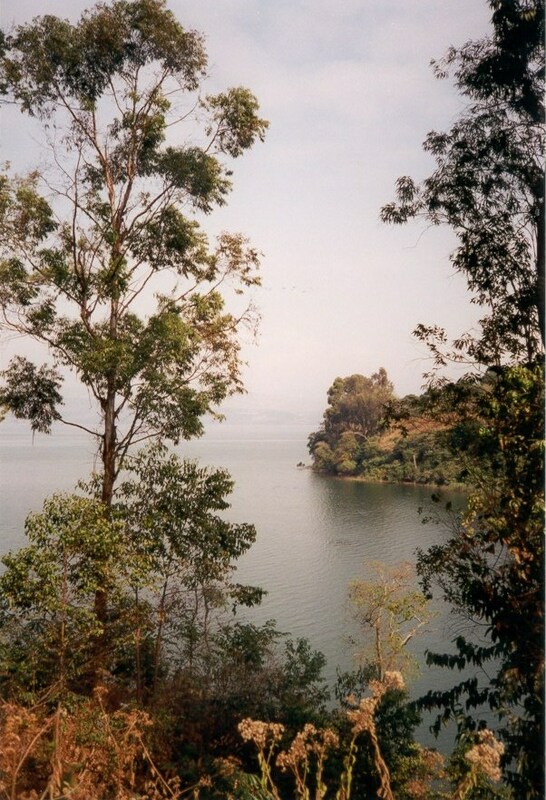 Across the lake one could see Bukavu in the Democratic Republic of the Congo. 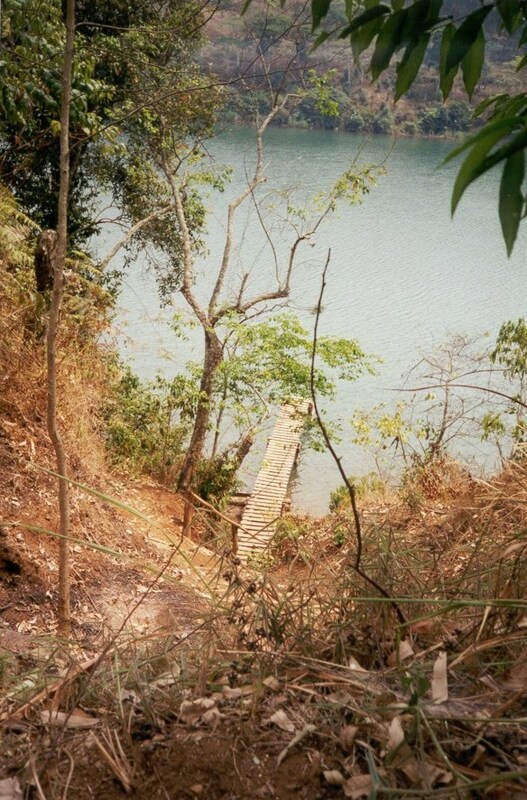 Following the path, one comes upon a sign that reads, "To the Plage", pointing the way to the edge of the water. 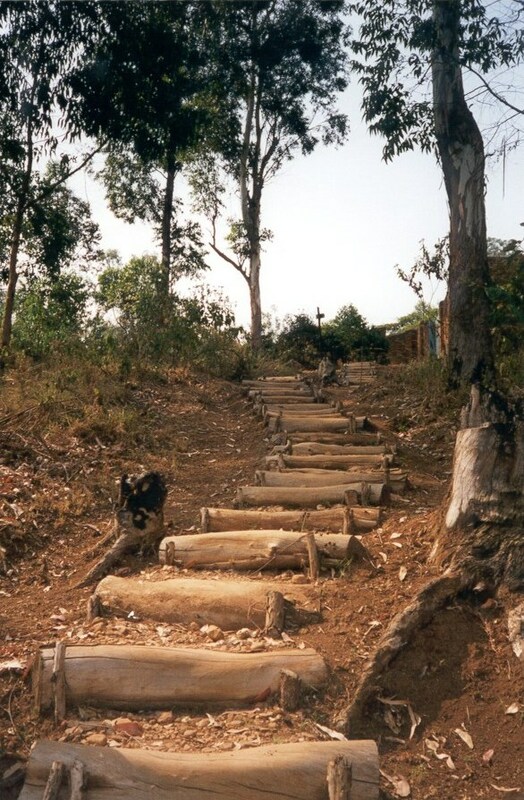 The path leads down the steep heel to a staircase made of posts and logs. 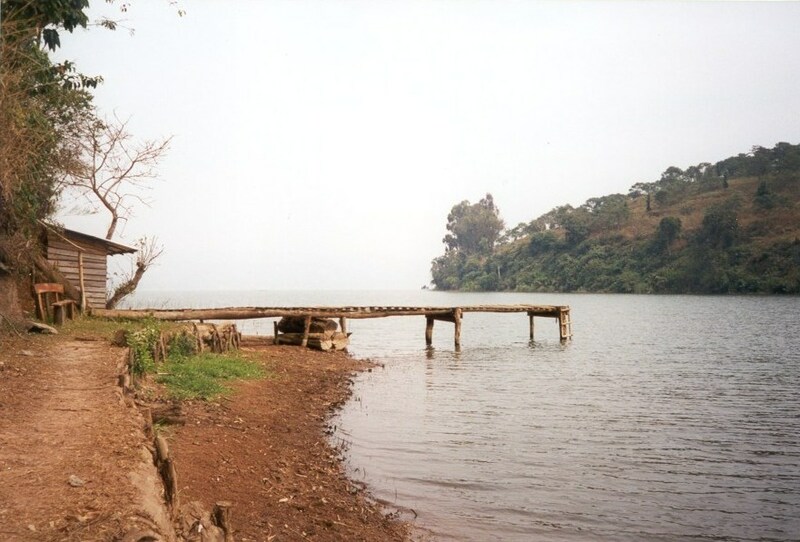 At the bottom of the stairs lay a pier that extended into the lake, away from the edge, which protects one from the parasites which can be passed to humans from the snails that feed on the reeds in the shallow water. 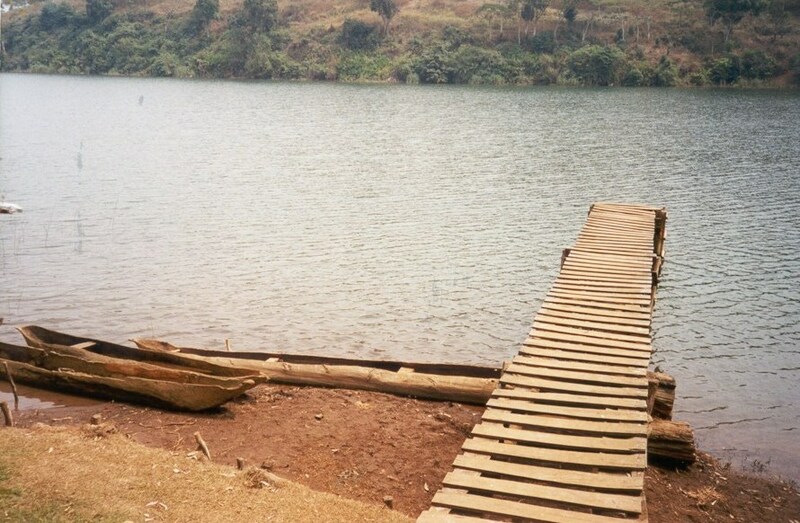 Luckily, the poisonous gases are not at this part of the lake. 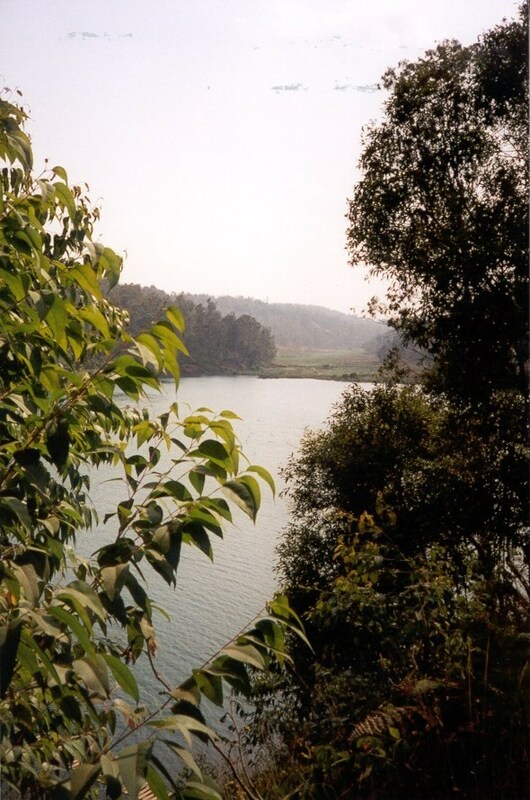 The lake at this point extends into a little cove below the guest house. The shack and the hollowed-out log boats by the pier made for perfect subjects to be photographed. If only I would have bought that better camera before my trip. 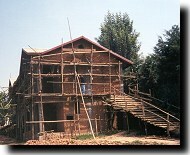 Bishop Ken has several projects under way. 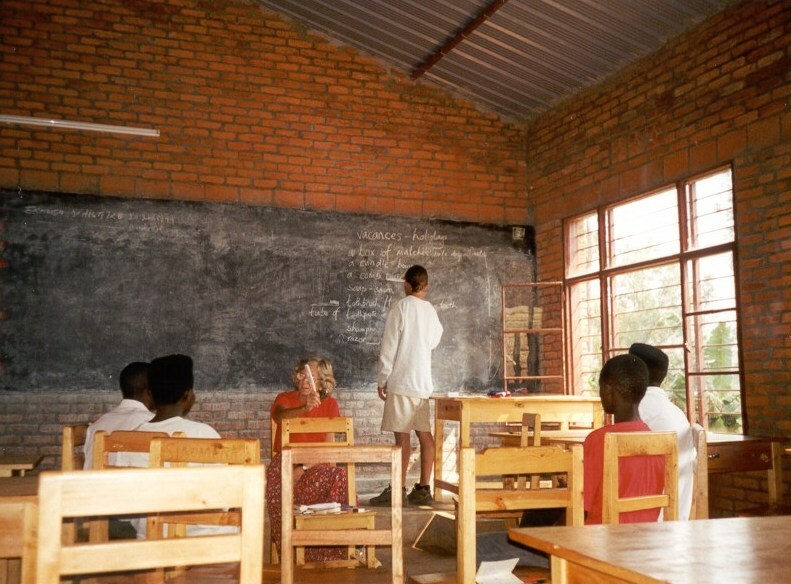 This is the finished vocation school; Saul, who was helping out with a summer English class, eventually enrolled in SOAS as well. .
Near the vocational school, many citizens have been hired to build this school. 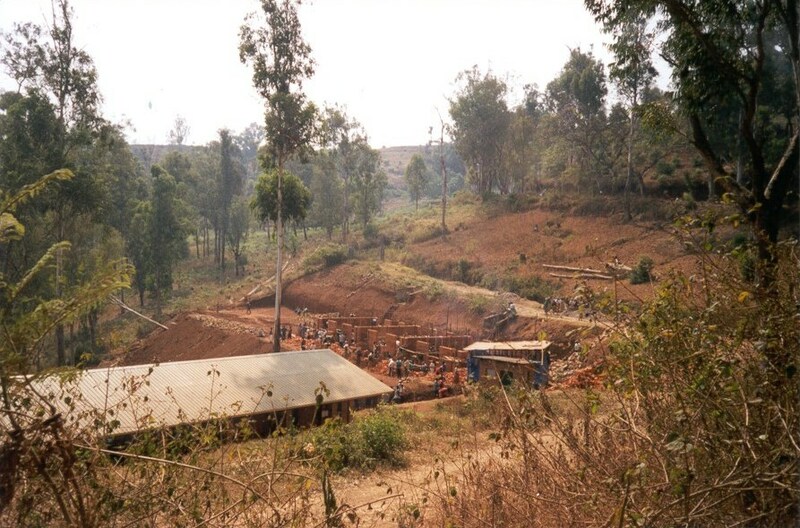 Those constructing this building are not workers from the city; they are prisoners (easily identifiable in their pink prison outfits) waiting to be tried for suspected roles in the 1994 genocide. 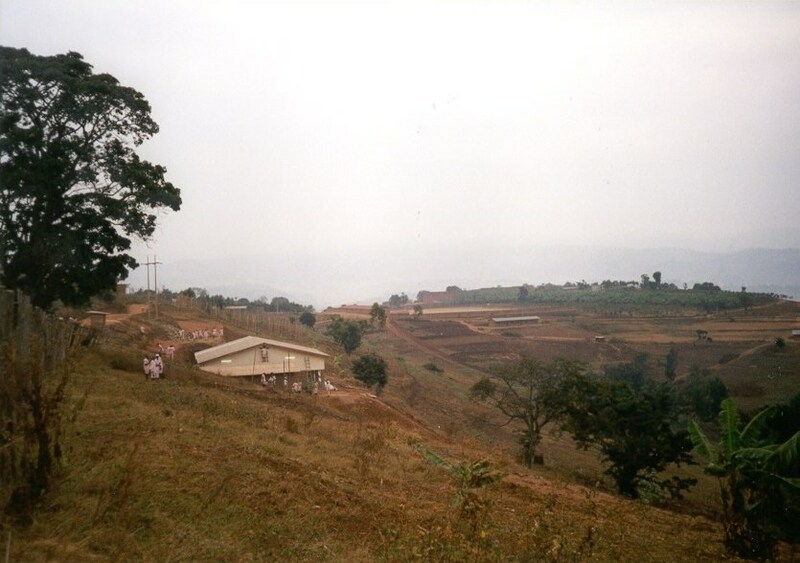 They live in the prison on the hill nearby, and a portion of the wages they make go to their respective families. 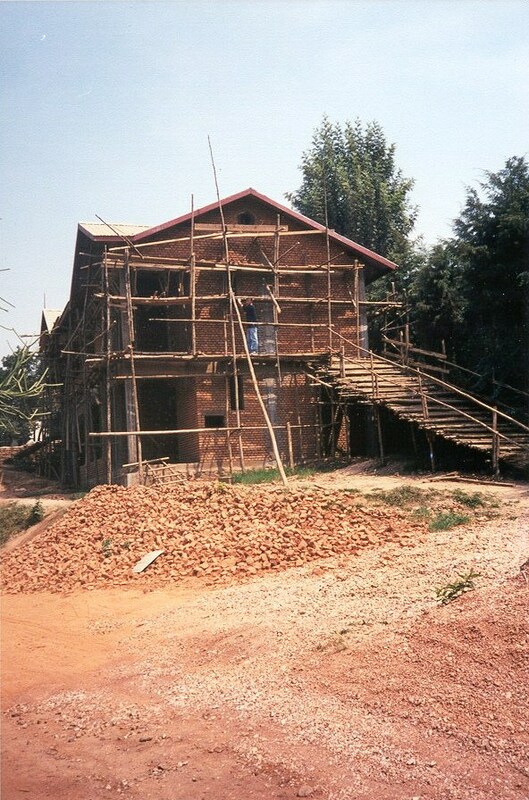 Elsewhere, another school is being built. 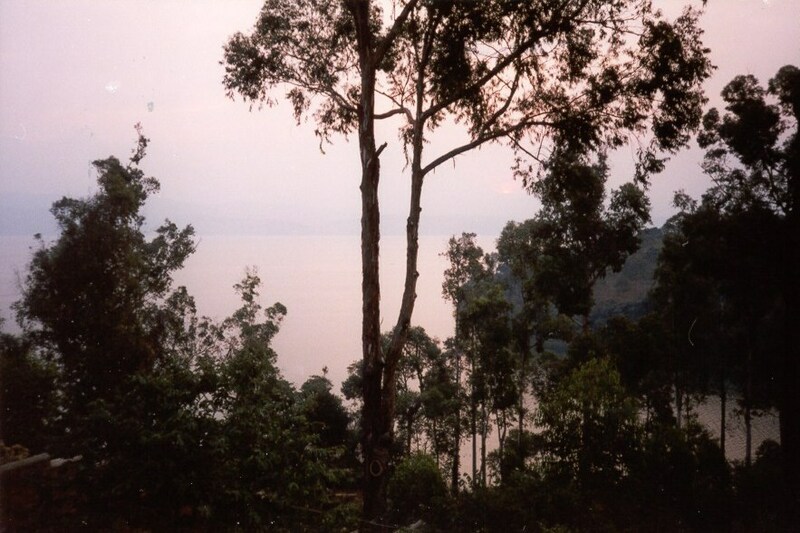 Evening and Lake Kivu always make a portrait-ready combination. 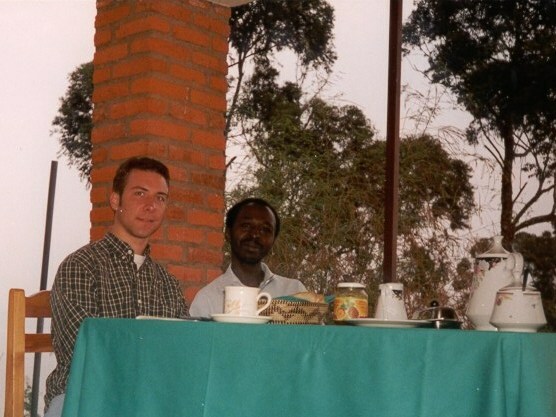 In the mornings, Emmanuel always made a good omelet. 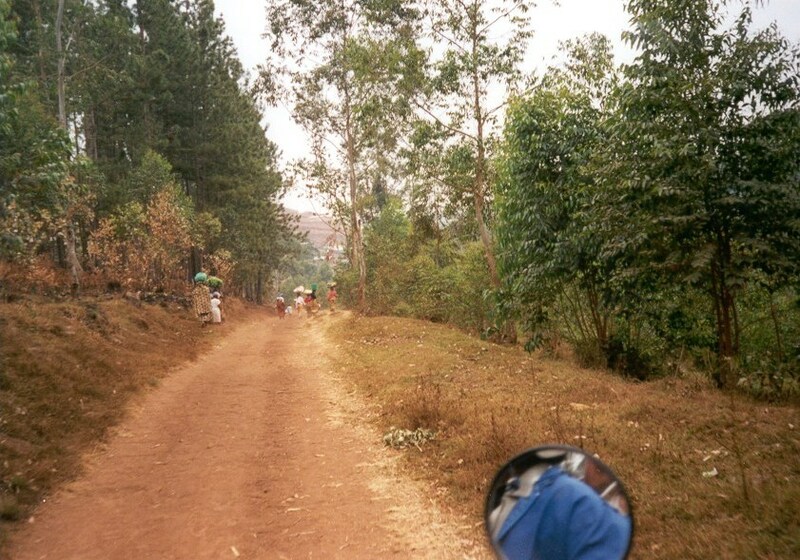 The reverend took me on his motorbike to see several other projects. Along the dusty roads one could always see the women carrying unbelievable loads on their heads. 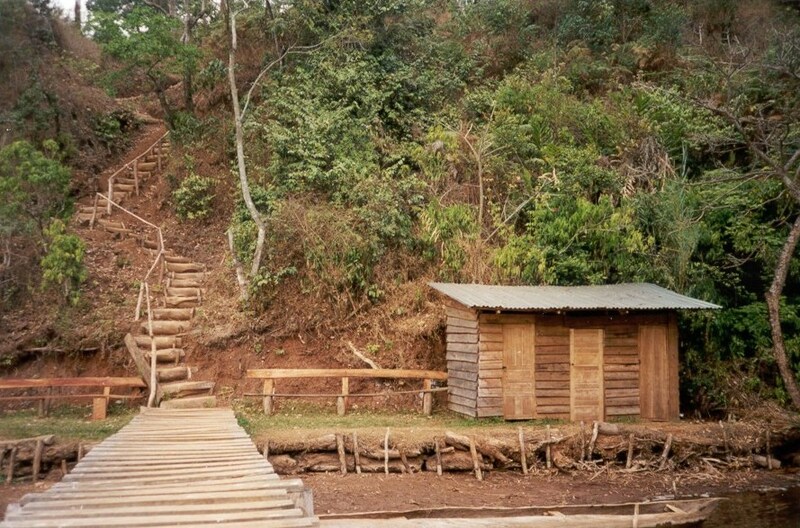 Those same dusty roads led up and down the many hills, covered with many houses, huts, and other habitations. 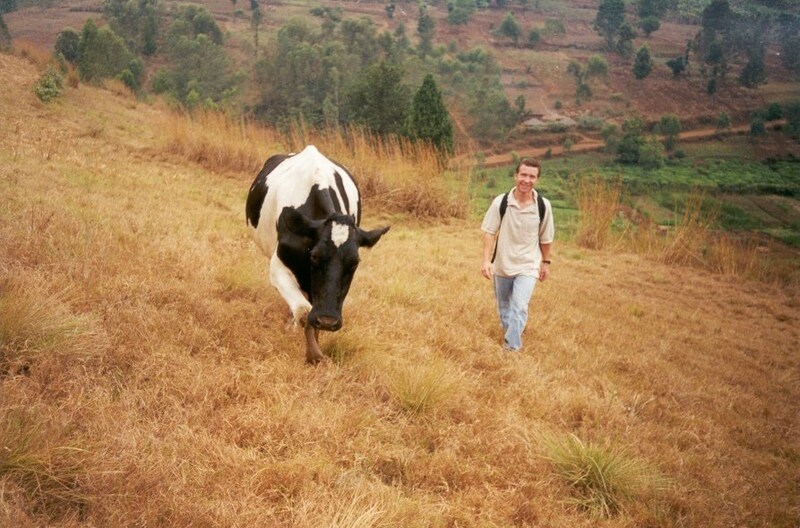 This particular cow was a gift from the Vice President of Rwanda. 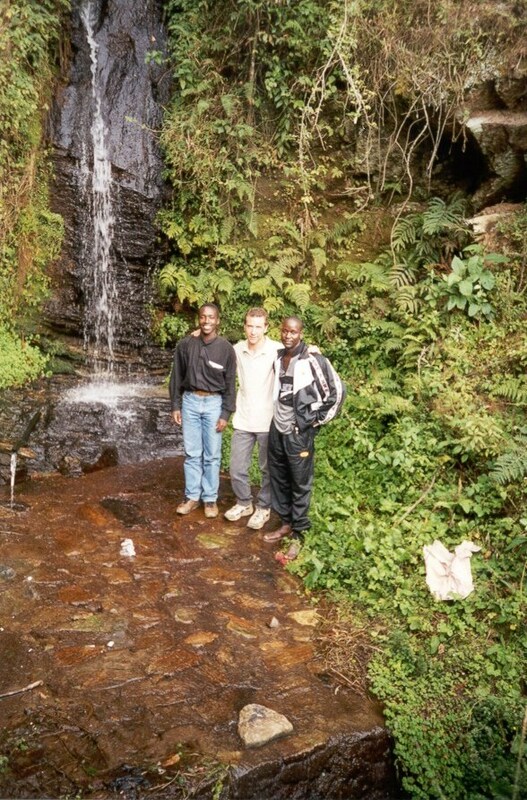 Since I had seen hardly any animals (that I couldn't see back home on my grandparents' farm) since my arrival in Africa (OK, I saw a Camel in Mombasa), I decided to travel from Cyangugu back to Kigali through the rain forest. 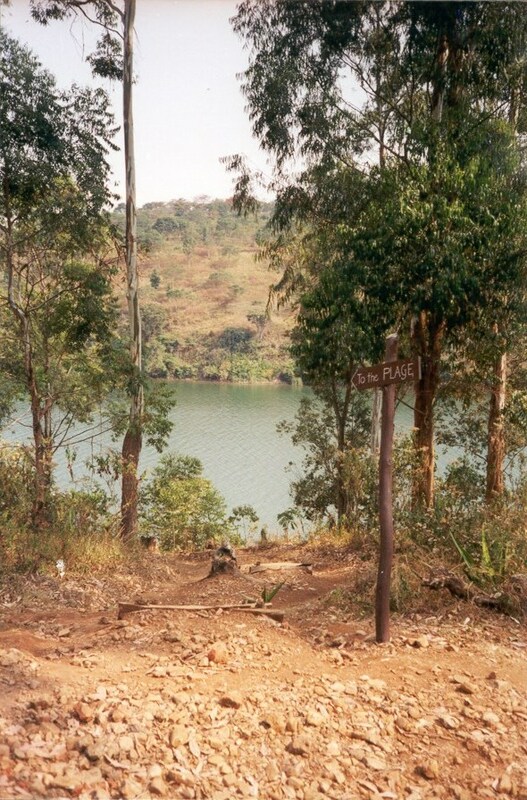 Once inside, the temperature drops; even from the road the thick jungle looks foreboding. I had heard that monkeys could be seen on way, so instead of sharing a bus (much like the matatus of Kenya) I hired a driver to take me along the route. We found a small waterfall. 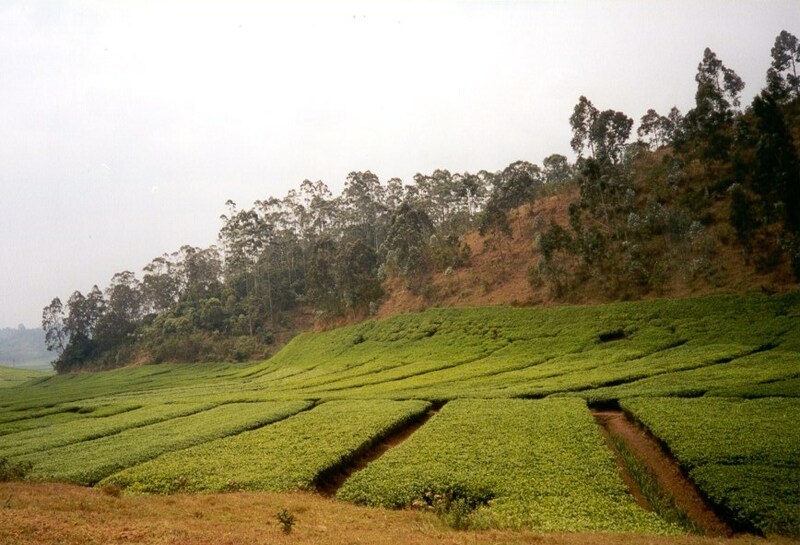 I also got to see fields of Rwandan tea being grown. 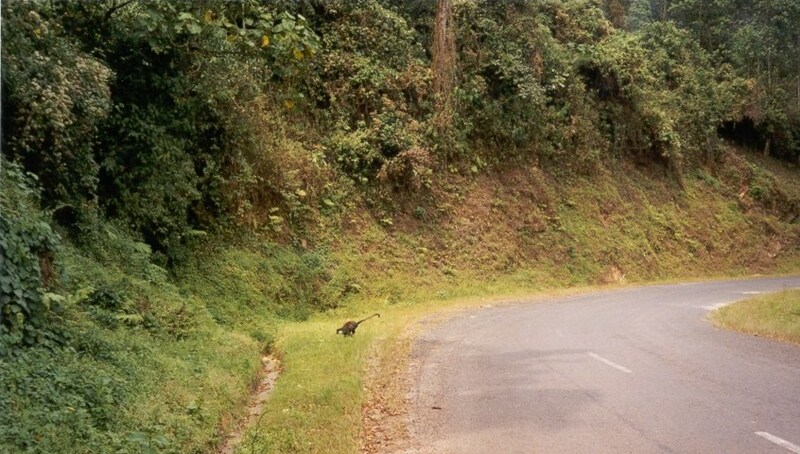 After a while we finally found a few monkeys resting in the road; they quickly ran off as we approached. 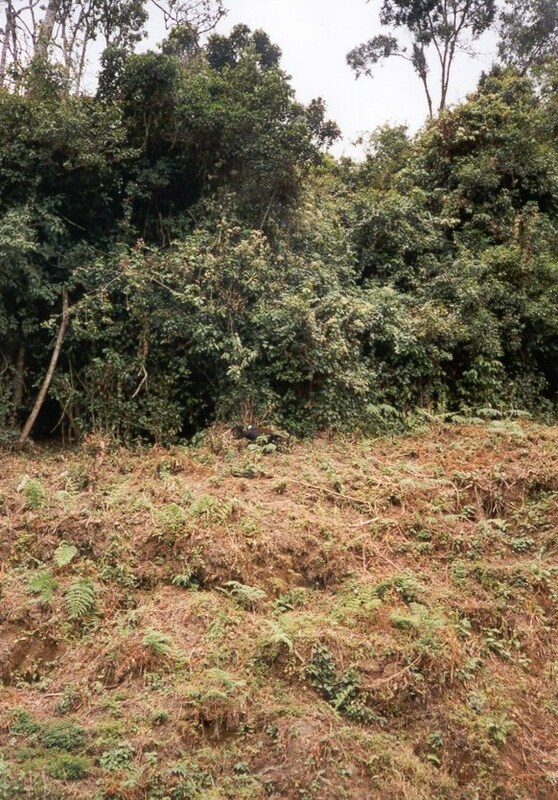 We found another group of monkeys, and I managed to get another picture, though not much better. It was worth hiring the taxi, I suppose, but these were expensive monkey pictures. 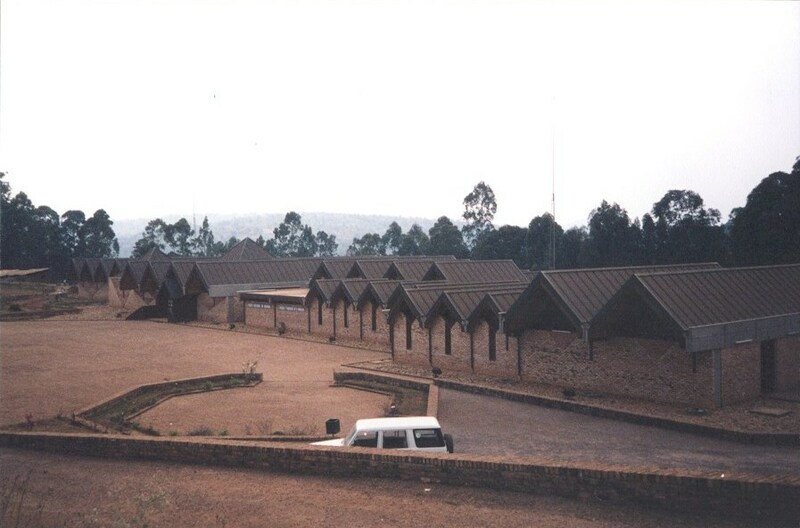 Having seen the monkeys, I changed to a shared taxi in Butare, after seeing the museum there, and continued to Kigali for my flight back to London.